Caenlin is a Bosmer pilgrim and the nephew of Baenlin, a resident of Bruma, who recently passed away when a giant, stuffed minotaur head "accidentally" fell down on him while he was resting in his chair. Caenlin is nowhere to be found in the game before the Accidents Happen quest is finished, at which point he rather quickly moves into his newly inherited estate. As he has no use for his uncle's "man-servant" Gromm, he kicks him out as the first thing, but then virtually takes over his uncle's life and habits: He sleeps in his uncle's bed in the upstairs area between 1am and 6am, and then heads downstairs for a three hour breakfast in the dining area. After that, he takes a two hour nap and then wanders around the second floor aimlessly until his lunchtime at 2pm. He takes his time, and it's early evening before he finally leaves the table at 7pm. He then proceeds to take a seat in the very same chair his uncle died in, securely knowing that no minotaur head will fall down on him. He will spend the rest of his evening relaxing in the chair until it is time to head back to bed. Not only did he inherit his late uncle's luxury estate and his habits, he seemingly also inherited his taste and choices in clothing, as he wears a similar outfit: a pair of blue suede shoes and a blue velvet outfit. He carries around the house key and a considerable amount of gold. 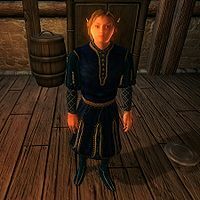 Upon his uncle's demise, the Black Horse Courier will print a special edition on the incident, in which Caenlin is quoted for blaming "structural instability" within the Bruma buildings for his uncle's death. As for the rumors about him being involved in any way, he uses one word: "Nonsense." When you talk to him, he is surprisingly composed and is definitely done with whatever grieving he had to do: "Hmm? Oh, Caenlin's my name. Maybe you knew my uncle, Baenlin? He died recently. Stuffed head fell on him. Very tragic. Well, goodbye." If, however, you killed Baenlin in any other manner, he will be even more blasé about his uncle's murder and remark, "Hmm? Oh, Caenlin's my name. Maybe you knew my uncle, Baenlin? He died recently. It was all very tragic. I'm heartbroken, of course. Well, goodbye." These two lines are the only remarks that you will ever get out of Caenlin as he will always end the conversation immediately after speaking to him.